Eena Lake is only 25 minutes northwest of Prince George. Its close proximity makes and easy access makes Eena Lake a popular destination for locals. 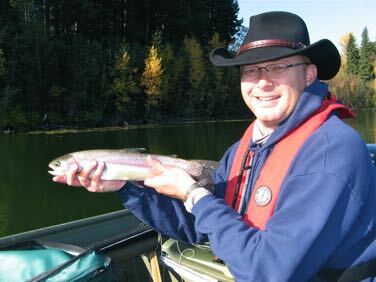 The lake is stocked wiith rainbow trout, with the average size of fish around 11”. There is a dock at the boat launch for shore bound anglers, but a float tube, pontoon boat or small boat is best. You can also launch a small boat from a trailer as long as it is a rowboat or powered by an electric motor.